This is experimental but it basically works. Managed to place several custom follower mods in Enderal. Theyre basically NPC replacers. In order to make them into followers they must be force recruited by using the Extensible Follower Framework mod except for Sofia. 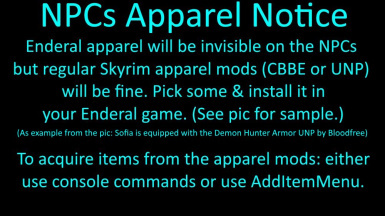 All NPCs will use regular Skyrim non Enderal apparel mods. *Again, the mods I did are just PATCHES. ORIGINAL follower mods are REQUIRED. - Sofia replaces one of the generic patrons. Sofia can be recruited using her regular follower interface but upon progressing with the recruitment dialogue.. a DOPPELGANGER (Double) is spawned. RECRUIT THE SPAWNED DOPPELGANGER INSTEAD OF THE FIRST SOFIA. Not fully tested but Sofia will have most of her regular custom follower features. Install the main mod first then install the patch after it. - Toccata replaces the Drunken Bee's Bard - Liliath. She retains Liliath's voice & habits. She roams around so she's not always inside the tavern (sometimes she's in the market.) She can be recruited by using EFF. Install the main mod first then install the patch after it. *Recommend to install non-scripted version. - Vivace replaces one of the Drunken Bee's patrons. She retains the patron's voice & habits. She can be recruited by using EFF. Install the main mod first then install the patch after it. - Chaconne replaces one of the Drunken Bee's patrons. She retains the patron's voice & habits. She can be recruited by using EFF. Install the main mod first then install the patch after it. 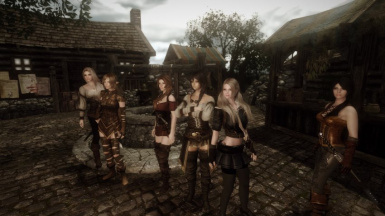 *Recommend to install non-hdt bodies on NPCs, like basic UNP or CBBE. *Although demo depicts Emily /Babydoll & Recorder to be included as direct edit of the main plugin worked, replicating a patch didn't. I apologize for this.